DuoLingo, founded by Luis von Ahn, also the creator of ReCAPTCHA, is an innovative language learning platform that enables people to learn a new language for free, while also translating web content for other users. DuoLingo makes a startling claim, that by combining monolingual users and language learners, it is possible to build a system that translates web content as well as professional translators. This sounds like an incredible claim, that a group of people who are just learning a language can translate as well or better than professional translators, but what is interesting about von Ahn’s system is that it relies on the wisdom of crowds to assess and score translations created by students. First some stats. Since its launch in June 2012, DuoLingo has acquired over 250,000 active users, most of whom are English-Spanish learners, an impressive number. 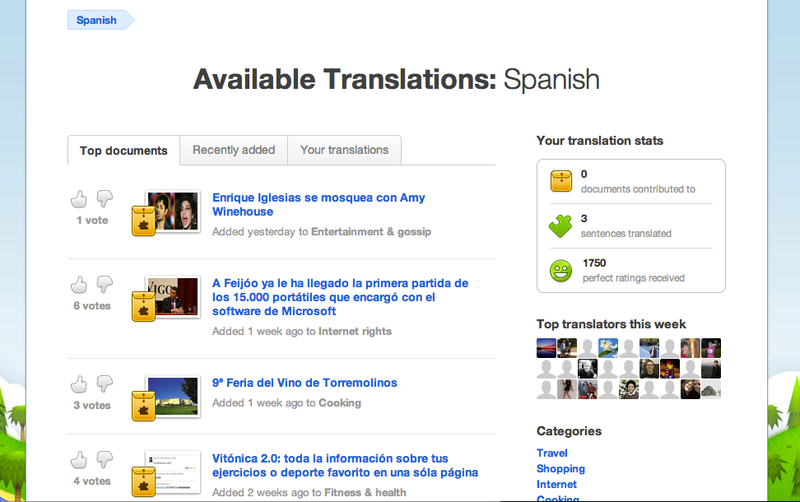 DuoLingo launched with English to Spanish, and has since added French and German. Portuguese and Italian are coming soon. 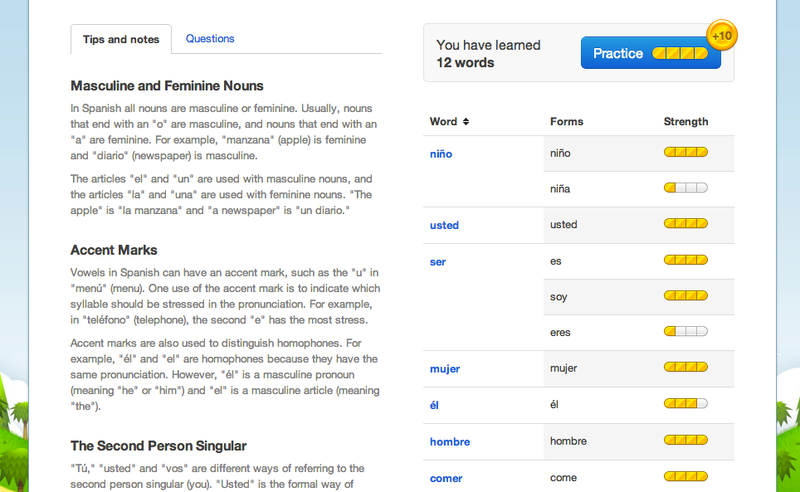 Spanish speakers can also use it to learn English. With their recent venture funding, they will be branching out to more languages in the coming months. Language learners start off by completing hand built lessons that are designed to teach a specific skill, such as food names, present tense verbs, or classes of adjectives. This is similar to the way traditional language learning programs work. Once the user has acquired a basic set of skills, Duolingo begins prompting them to translate real-world content that the system has picked up from sources like Wikipedia and other publications. This makes the exercises more interesting for students, who know they are helping translate the web, versus completing a pointless textbook exercise. Many students are asked to translate each text, and to score each others work. This collaborative approach enables the system to identify the best translations created by students, while also providing students with collaborative feedback. The system assesses quality by looking at a combination of scores from other students, and repeating patterns among proposed translations (if a text is translated the same way many times by different people, this is a strong signal that it is correct). Monolingual users can also be put to work reviewing completed translations for style and grammatical correctness. This can often be done without viewing the original text. For example, a native Spanish speaker can clean up a translation created by a non-native speaker where the meaning is clear, but wording and style are not quite right. Duolingo claims translation quality on par or better than professional translators. They evaluated translations generated by their system against low cost web translation agencies such as Gengo (5 cents per word) as well as individually hired professional translators (20 cents per word). They found that for general purpose web content, quality was comparable or better (they did not disclose the metrics used). However this was not true for specialist material (legal, medical, etc), because this requires the translator/worker to have deep understanding of the source material, in addition to language skills. This entry was posted in crowd translation, language learning and tagged education, french, german, instruction, italian, learning, lessons, portuguese, spanish. Bookmark the permalink. Reblogged this on Mar Loureiro.